Some of the estimated 2,000 spectators come up the 18th fairway at Quaker Ridge. 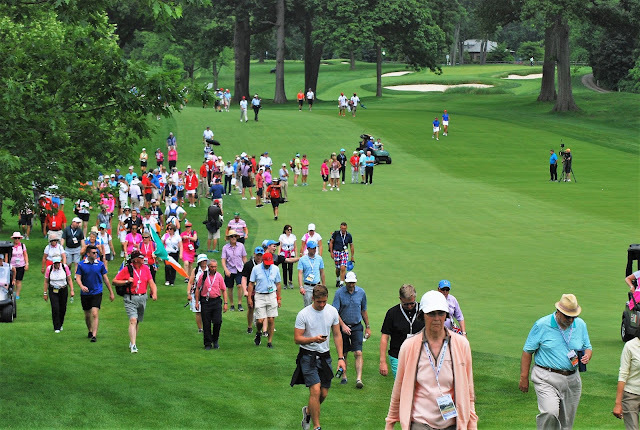 With entry free, there is no real way of knowing how many have come along to the first day's play but the USGA officials estimate 2,000, give or take a hundred or two either way. +USA led 2-1 after the opening morning four-balls. Olivia Mehaffey / Sophie Lamb bt Mariel Galdiano / Andrea Lee 3 and 2 to level overall match at 2-2. Mehaffey and Lamb lost the first hole with a bogey 6 but winning par 4s were good enough to win them the second and fourth for a one-hole lead. Galdiano and Lee had a double bogey 6 at the sixth and GB and I's par 4 extended their lead to two holes. Mehaffey and Lamb took a firm grip, or so it seemed, of the match when they birdied the eighth to go three up. A half in par at the ninth saw them reach the turn in 36 shots to the Americans' 40. Tenth and 11th holes were halve in pars before the USA pair won their first hole since the first hole in the match. Mehaffey and Lamb had a double bogey 6 at the 12th where Galdiano and Lea had a birdie 3. GB and I's lead cut to two holes with six to play. Mehaffey and Lamb reasserted their authority by winning the 13th with a par 3 and the 14th with a birdie 4 ... moving to four up with four to play. Mehaffey and Lamb lost the 15th with a bogey to be three up with three to play. A half in par at the 16th was all the Brits needed to clinch a 3 and 2 victory. Alice Hewson / India Clyburn lost to Jennifer Kupcho / Lilia Vu 4 and 2. Kupcho and Vu won the first hole with a par 5 but ran up double bogeys at the second and third to let GB and I go one up. The Americans settled to get the first birdie of the match at the fourth to square the contest. Hewson and Clyburn hit back with their first birdie, a 2 at the short fifth to go one up. The fifth and sixth holes were halved in pars. Hewson and Clyburn ran up a double bogey 6 compared with their opponents' birdie 3 at the seventh and that squared the contest. The English pair seemed to have lost their rhythm. They bogeyed the eighth to go one down and then had their second double bogey in three holes at the ninth, which the Americans birdied to reach the turn in 37 to Hewson and Clyburn's moderate 42. After nine holes, three winning holes in a row had turned the match in favour of the USA. The 10th was halved in 3s which broke the USA's winning sequence. The short 13th was halved in birdie 2s and then the Americans went two up with five to play with a birdie 4 at the 14th. Hewson and Clyburn kept their hopes alive by winning the 15th with a par and halving the 16th to be one down with two to play. If the English pair could halve the match, then GB and I would go into the second day only a point in arrears. The 17th was halved in 4 so that USA stood one up on the 18th tee. Hewson and Clyburn ran into greenside bunker trouble at the last hole and lost it, to go down 4 and 2. Paula Grant / Lily May Humphreys lost to Lauren Stephenson / Kristen Gillman 4 and 2. The first three holes were halved in pars before Stephenson and Gillman jumped into a two-hole lead with birdies 3 and 2 at the fourth and fifth. Grant and Humphreys chalked up their first birdie, a 3 at the sixth, to win the hole and cut the USA lead to one hole. Grant and Humphreys won three holes in a row to turn the tables on the Americans and lead by one hole after the eighth. The English pair won the seventh with a par and the eighth with a birdie 3 but bogeyed the short ninth to be all square the turn. GB and I were out in 35 shots to the Americans' 34. The 10th was halved in par 3s and then Stephenson and Gillman birdied the 11th to gone up with seven to play. After the 12th was halved, the Americans won the 13th with a par to go two up with five to play. Stephenson and Gillman also won the 14th with a birdie 4 to go three up with four to play. The 15th was halved and then the Americans wrapped up 4 and 2 victory by birdieing the 16th. That restored the overall USA lead at 3-2 with one match still to finish.